FOR SUCH A TIME AS THIS: Last month, presiding bishops of the ELCA and The Episcopal Church issued a joint invitation to a season of prayer, fasting and advocacy. Concerned about proposed deep cuts to programs that are vital to people struggling with poverty and hunger, ELCA Presiding Bishop Elizabeth Eaton shared a video inviting others to join her in a day of fasting each month, prayer and public witness. ELCA Advocacy and the Episcopal Office of Government Relations will share action alerts, resources, prayers and other ways to take action around the fasting days each month. More resources and information will be shared before the next fasting day on June 21. PRESIDENT’S BUDGET REQUEST: President Donald Trump sent his 2018 budget request to Congress May 23 – a wish list of sorts that shares the administration’s hopes and priorities for the annual budget. The budget blueprint makes many cuts to non-military programs across-the-board, many of which would be devastating to poor and hungry people. Some signature programs, such as the Community Service Block Grants that address long-term poverty in local communities, have been completely “zeroed out” in the budget proposal. For international development, Trump also proposed a 30 percent cut to foreign assistance programs, with some accounts faring worse than others. If enacted, emergency migration and refugee assistance, global health programs, development and humanitarian assistance would receive the most significant reductions. It’s unlikely that Congress will agree to cut foreign assistance funds by that much, however, because the scale of cuts being proposed is quite big, much advocacy is needed to maintain consistent funding levels. The budget-writers in Congress will be preparing their own plan within the next few weeks. ELCA Advocacy will be preparing action alerts around the appropriations process in the summer and fall. METHANE SAFEGUARDS UPHELD IN CONGRESS: On May 10, the Senate’s vote to repeal the Bureau of Land Management (BLM) Methane Waste Rule failed on the Senate floor by a vote of 51-49. The BLM methane rule reduces excessive greenhouse gas waste on federal land, requiring oil and gas operators to use up-to-date technologies to better control leaks and emissions. 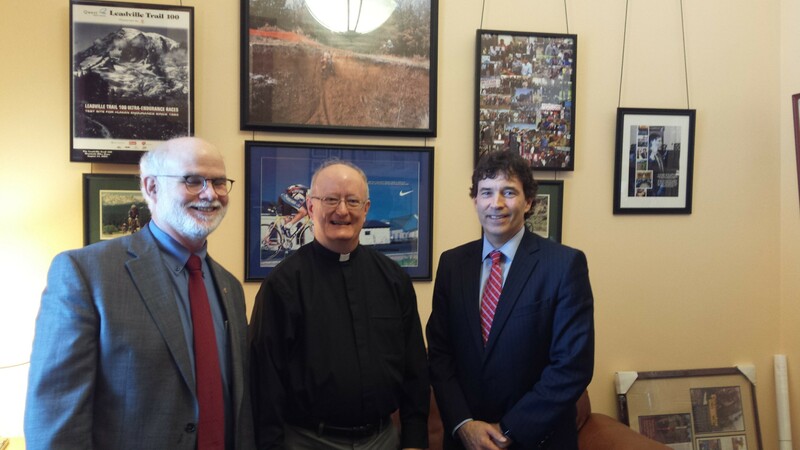 The protection of the methane rule is a legislative victory for care for creation advocates in the faith community. ELCA Advocacy, Lutheran professors and theologians, and other leaders have supported the rule with action alerts and testimonies since 2015. The Trump administration has issued a review of the rule, but it will likely be several years before it is completed. PARIS AND U.N. CLIMATE CHANGE CONFERENCE: ELCA Advocacy issued a statement June 1, following Trump’s decision to begin the process of withdrawing from the Paris Agreement. As believers in, but not of, the world, we pursue a multifaceted approach to living out our faith – modeling good stewardship of God’s creation through faith, policy, service and change. 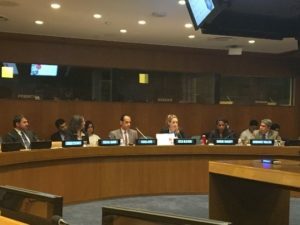 ELCA Advocacy also attended the U.N. Climate Change Conference in Bonn, Germany, earlier this month. Progress was made on continuing the implementation of the Paris Agreement in advance of the COP23 meeting in November. Some of the areas being negotiated include maintaining transparency, climate finance and incorporation of gender policies. CENTRAL AMERICA PRIORITIES: The U.S. and Mexico will be co-hosting a conference June 14-16 in Miami to discuss private investment and security goals around economic development and governance issues in Guatemala, Honduras and El Salvador. ELCA Advocacy, along with other organizations sent a letter to U.S. Secretary of State Rex Tillerson expressing concern over what appears as a discussion focused only on homeland security and militarization rather than prioritizing human rights and building an inclusive sustainable economy. CLIMATE CHANGE, MIGRATION AND DISPLACEMENT – NEW PERSPECTIVES ON REGIONAL APPROACHES TO CLIMATE-INDUCED MIGRATION, DISPLACEMENT AND RELOCATION: On May 22 and 23, U.N. University hosted an event on climate change, migration and displacement. The panel was research-focused, including panelists with scholarly expertise on the issue. One of the main messages was that seasonal migration is becoming long-term migration, while internal migration is becoming cross-border migration. There exists a vicious cycle between human displacement and environmental degradation. Professor Maxine Burkett, global fellow of the Woodrow Wilson International Center for Scholars, remarked that in her study of indigenous communities affected by climate change, the central tenant is the community’s decision to migrate together, not as an individual or family decision. Dr. Susana Adamo, from the Center for International Earth Science Information Network at Columbia University spoke of migration as a form of adaptation to climate change. SECOND INFORMAL THEMATIC SESSION ON THE GLOBAL COMPACT ON MIGRATION: On May 22 and 23, member states held a second informal thematic session on: “addressing drivers of migration, including adverse effects of climate change, natural disasters and human-made crisis, through protection and assistance, sustainable development, poverty eradication, conflict prevention and resolution.” The session included robust participation by member states and members of civil society organizations. The thematic session consisted of three panels: sustainable development and poverty eradication; human-made crisis as drivers of migration; and climate change as a driver of migration. An emphasis was put on the need for disaggregated data collection to influence global policy decisions and a need to revise national and international frameworks pertaining to migrants. 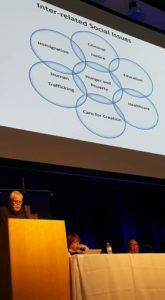 Migration was emphasized as a vehicle for climate adaptation and development; while addressing the root causes of movement was the focus of many interventions. The ambassador of Finland reminded member states that neither the migration nor the refugee compact has a mandate to address the plight of internally displaced people, presenting a legal protection gap. 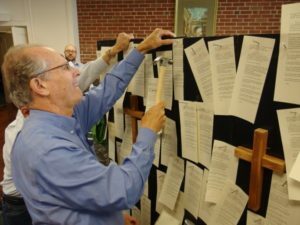 SYNOD ASSEMBLIES: LOPP-CA Director Mark Carlson attended the Sierra Pacific, Pacifica and Southwest California Synod assemblies with a display and many opportunities for renewing and making new relationships. 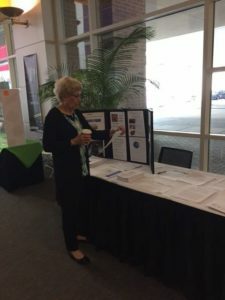 In Fresno, over 40 people attended a breakfast hosted by LOPP-CA that featured an attorney with the Leadership Counsel for Justice and Accountability, a group working in the San Joaquin and Coachella valleys to promote environmental justice and civic engagement in historically disadvantaged communities. LEGISLATIVE UPDATE: The deadline for passage of bills out of their house of origin was June 2, and legislation supported by LOPP-CA had mixed results. Reform of the money bail system, which can drive people into poverty and disproportionately affects people of color, passed the Senate and is pending in the Assembly, where a similar bill failed to meet its deadline. SB 54, the California Values Act (“sanctuary state”) passed the Senate and is pending in the Assembly. A meeting on immigration between faith advocates and leaders and Gov. Jerry Brown’s staff is scheduled for later in the month. 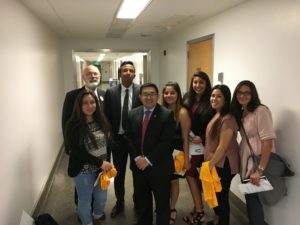 The Legislature has augmented what the governor included in his May budget proposal for legal and naturalization assistance for immigrants. The full budget is due on his desk by June 15, subject to line-item vetoes. Legislation to renew and update California’s climate change law has stalled, and the oil industry has launched a media campaign targeting swing legislators. ADVOCACY DAYS: LOPP-CA participated in Early Learning Advocacy Day, LGBTQ Advocacy Day (immigration track), Immigrant Day, ENACT Day (food, health), and Free Our Dreams (Alliance of Men & Boys of Color and others), where Mark was a team “captain” for a group of high school students and their adult companion from San Diego. 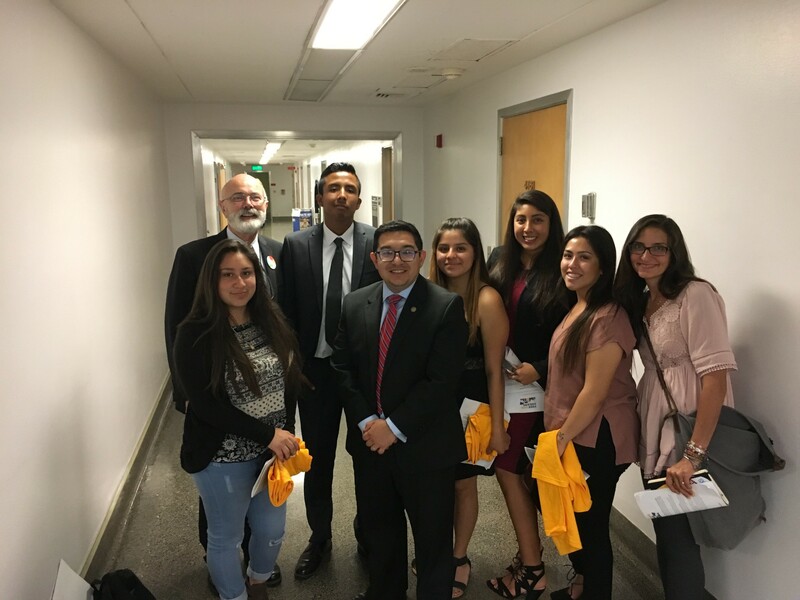 Mark introduced them to legislative staffer Eric Guerra, who is on the Sacramento City Council and was undocumented as a child (photo right). END OF SESSION: The Colorado General Assembly adjourned on May 10. Several LAM-CO supported bills were passed and signed by the governor. 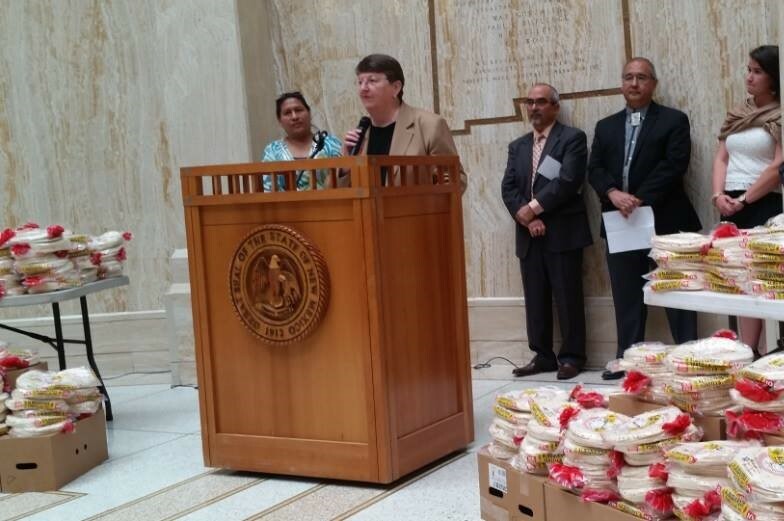 These included: HB 1002, Child Care Expense Income Tax Credit Extension; HB 1116, Continue Low-Income Household Energy Assistance; SB 207, Strengthen Colorado Behavioral Health Crisis System; SB 245, requiring landlords to give 21 days’ notice (up from seven days) to residents on leases of less than one year regarding end of lease or rent increases. All four bills received bipartisan support in both chambers of the Legislature. We also were pleased that a bill we opposed was defeated. SB 003 would have repealed Colorado’s health benefit exchange without replacement. The bill was removed from consideration on the Senate floor, which likely means that it lacked votes to pass. A HUGE thank you to all the advocates who took action to oppose this bill! IMPACT OF AHCA AND BUDGET PROPOSALS ON COLORADO: LAM-CO is deeply concerned about the American Health Care Act (AHCA) as well as the executive branch’s proposed federal budget. In Colorado, the AHCA would have disastrous effects on Medicaid recipients: nearly 600,000 Coloradans would lose coverage and Colorado would lose $14 billion in revenue by 2030. Budget proposals to shift the cost of food assistance to the states would cost Colorado $1.3 billion over 10 years, money the state does not have. We oppose the suggestion that vulnerable populations can be used as a “bargaining chip” in making severe cuts to our nation’s already feeble social safety net, on which so many hard-working Coloradans rely. END OF LEGISLATIVE SESSION: Another year ending in chaos! Although both chambers finished their budget bills by Easter, leaders failed to include all parties in final negotiations. So the final weekend ended in a scramble to negotiate bills that could pass and survive veto threats. With a deadline looming, a “special session” was announced, “to start 12:01am Tuesday and end Wednesday at 7am.” It ended at 3:30 a.m. Friday! AFFORDABLE HOUSING: Lutheran Advocacy-Minnesota supporters made many contacts with legislators (calls, emails, visits, Lutheran Leader Advocacy Day) and a letter from all six bishops (then leveraged by a House champion), that helped defeat attempted housing cuts. Our Homes for All coalition achieved $77 million for affordable housing in bonding, tens of millions higher than in initial bills. The Health and Human Services bill included serious cuts but added a one-time $2.5 million increase for programs we supported. Our action also protected the Minnesota Housing Challenge Fund and secured $2 million for CLASS Act to help homeless children excel in school (called “Homework Starts with Home” in the bill). CREATION CARE: Clean energy and the environment did not fare as well, and the energy and environment bills took us backwards. Nevertheless, our advocacy combined with our partners, helped prevent some extremely harmful provisions, as the Environmental Quality Board was not eliminated and permit compliance is still under state regulation, rather than allowing polluters to police themselves. Watch for more information coming soon in a newsletter and on our website! 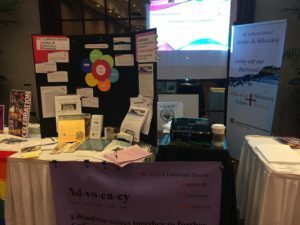 NORTH CAROLINA SYNOD ASSEMBLY: Justice and advocacy ministries were present and active during our 2017 Synod Assembly June 2-3. Voting members and visitors received information packets explaining ELCA Advocacy Ministries and could try out our new “NC Synod’s Got JAM” introductory slogan. 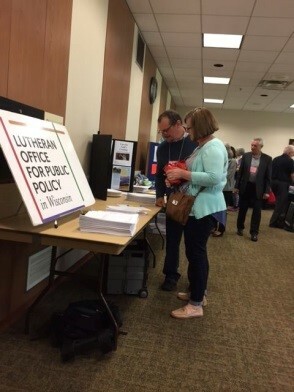 Team members made themselves available at their exhibit table (photo right) to hear stories about social justice ministries active in congregations and offer ways to expand those ministries to include faith-based public policy advocacy. The Ohio Association of Foodbanks can purchase fruit, vegetables and meat from Ohio farmers at a reduced price and provide these goods to Ohioans in need through an extended network of food pantries. However, the Ohio House proposed a $1 million cut to these programs (over two years). 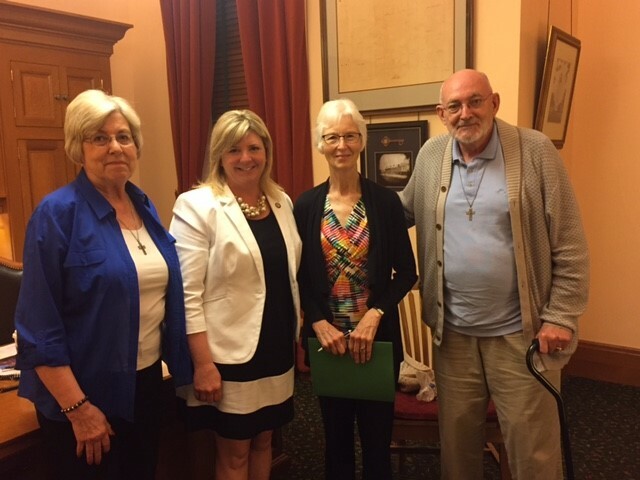 Faith leaders and many others encouraged the Ohio Senate to restore this funding and increase funding by $5 million a year. The Senate and House must agree on a final version of their budget and send it to the governor by June 30. Want to get involved? Write a letter to your local newspaper today! You can see more on our website at .hungernetohio.com/letters-to-the-editor/. 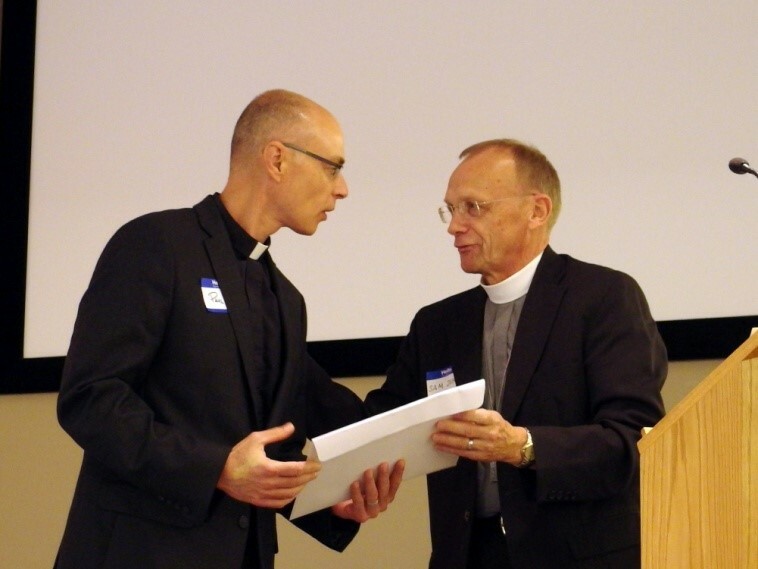 How do we express, in Lutheran terms, that advocacy for justice is at the heart of being the church? How do we advocate for public policy that supports justice and earth-care while ALSO being a reconciling presence, bringing people together rather than driving them apart? Where is hope in the midst of so many powerful forms of injustice crashing in among us? ugee Service, John Moeller and Melanie Johnson with Lutheran Services of Georgia presented workshops on Circle of Welcome. Mary Campbell with ELCA AMMPARO moved between those workshops to our advocacy workshops to talk about Welcoming Congregations and the Guardian Angels ministries. Our policy council and ready bench leaders helped with our workshops, primarily focused on congregational advocacy, and helped staff our ELCA Advocacy exhibit; three of our synod hunger leaders staffed the ELCA World Hunger exhibit. The synod Green Team had a pre-assembly workshop, an exhibit, and maintained a resource room throughout assembly. We also officially rolled out our Congregational Advocacy Guide and our new database. Another highlight of the assembly was the presentation of our new Robert S. and Jean E. Graetz Advocacy Award to Robert and Jean Graetz. Robert is a retired Lutheran pastor in Montgomery, Ala. 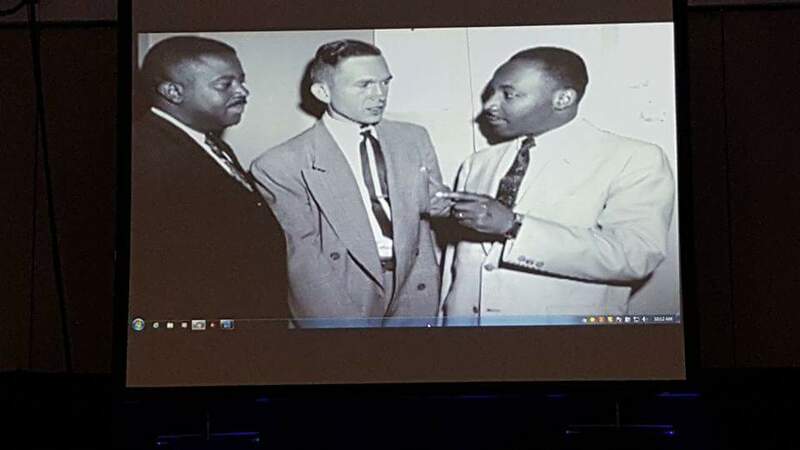 He and Jean were involved in the Montgomery bus boycott with Martin Luther King Jr. and others. They have continued their work in advocacy over the last 62 years. In April, the General Assembly voted against Gov. Terry McAuliffe’s proposal to expand Medicaid to the 400,000 Virginians still left without access to health coverage. 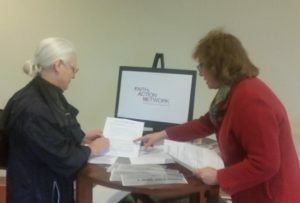 The Virginia Interfaith Center for Public Policy was encouraged, however, when Republican leaders expressed willingness to look at ways to “close the coverage gap.” VICPP will encourage the newly formed joint legislative committee to consider how Virginia might tap federal dollars to expand health care access and will continue advocating with Virginia representatives at home and in Congress on health care access. The center teamed up with the Jewish Community Relations Council of Greater Washington to encourage everyone to hold an Interfaith Welcoming Seder during the Passover season. The center created a model Seder service to use. VICPP is also sponsored a May Day rally for immigration rights and organized a protest of the White House travel ban on outside the courthouse where the Court of Appeals was debating it. On June 11, Gov. 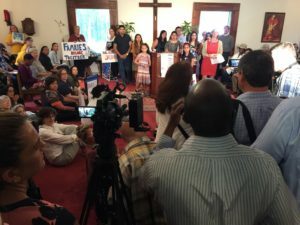 McAuliffe signed into law a bill on driver’s licenses, legislation that the Virginia Interfaith Center worked for in the most recent session of the General Assembly. The Richmond VICPP chapter is partnering with the city’s Office of Community Wealth Building to develop a Living Wage Certification program. This is a voluntary program designed to recognize and promote employers that pay living wages. The Northern Piedmont Chapter hosted a “Removing Barriers to Affordable Healthcare” community forum. STATE LEGISLATURE: The 2017 regular session ended April 23 with no biennial budget agreement, and we are now in our second 30-day special session. A group of 8 to 12 legislative leaders from both parties are working on a revenue solution to fund the state Supreme Court ruling regarding our K-12 public education system, as well as the regular budget. LOCAL (SEATTLE and KING COUNTIES): FAN supported a significant police accountability ordinance, which passed the Seattle City Council last month. The other key local issue is making our juvenile justice system more focused on treatment than on incarceration. STATEWIDE INITIATIVES: These include: a bathroom-use initiative that discriminates against transgender people, which we oppose; an initiative to reform our state’s statute on the use of deadly force by law enforcement; and an initiative to institute a carbon tax. REGIONAL SPRING SUMMITS: We were excited to gather with 30 advocates in Yakima and 20 in Spokane for conversations about the legislative session and strategizing for the year ahead. We will soon hold similar events in Vancouver and Seattle. Representative Jimmy Anderson, Fitchburg, questioned how people in poverty would fare because of a constitutional convention. He specifically said he was worried that Social Security could be dismantled. He said such a convention would put our country at great risk. 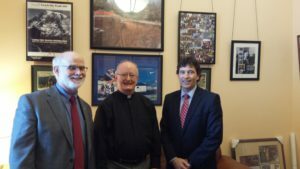 WATER: LOPPW continues to work with the League of Conservation Voters and other groups advocating for a bill that would make it easier for public utilities to assist homeowners to remove lead from their pipes. 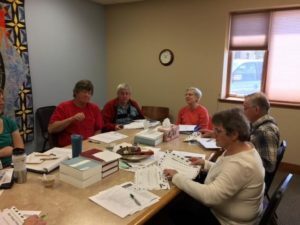 SYNOD ASSEMBLIES: In May, LOPPW had a presence at the Northern Great Lakes Synod Assembly in Marquette (photo, below, left), Mich., and the East Central Synod of Wisconsin Assembly in Green Bay (photo, below, right). LOPPW met with the La Crosse Hunger team to explore advocacy around the upcoming Farm Bill.